Volunteering his research efforts under the non-profit Consumer Wellness Center, the Health Ranger found that Total Blueberry Pomegranate cereal contained neither blueberries nor pomegranates. 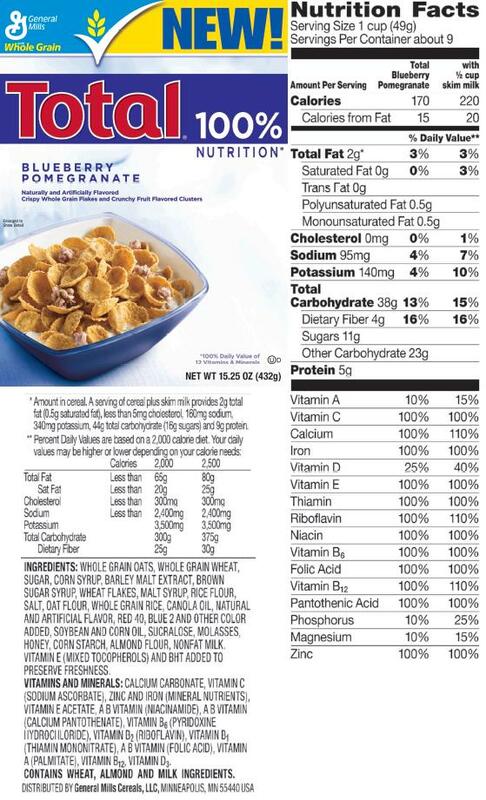 Yet it is called "Total Blueberry Pomegranate Cereal" and positioned as a highly nutritious cereal with the words "100% nutrition," "Blueberry" and "Pomegranate" appearing prominently on the front of the box, in a very large font size. While the cereal contains no actual blueberries or pomegranates, it does contain eight different sweeteners: Sugar, Corn Syrup, Barley Malt Extract, Brown Sugar Syrup, Malt Syrup, Sucralose, Molasses and Honey. The blueberry-like appearance of small bits in the cereal are accomplished through the use of artificial colors like Red #40 and Blue #2, combined with various oils and sweeteners such as soybean oil and sugar. "When consumers buy Total Blueberry Pomegranate Cereal, they fully expect it to contain at least some amount of real blueberries and pomegranates," explained award-winning investigative journalist Mike Adams, who narrates the Food Investigations video. "For General Mills to use these words on the front of the box and then fail to deliver any actual blueberries or pomegranates in the product is extremely deceptive." "By choosing to pursue this deception, General Mills has tarnished its reputation among consumers worldwide who are now learning they cannot trust General Mills products to be honestly labeled," Adams added. Adams is a strong proponent of real blueberries and pomegranates, which he describes as "plant-based medicines" that offer powerful nutritional support for preventing degenerative disease. Over the last several years as the news about the health benefits of blueberries and pomegranates has spread, large food companies have jumped on the bandwagon and attempted to use blueberries or pomegranates in their formulations. "General Mills jumped on the blueberry bandwagon but forgot to bring the blueberries," Adams added. Adams suggests General Mills should change the name of their cereal to "Totally NOT Blueberries and Pomegranates." General Mills is not an evil company, at least not in the sense of "Monsanto evil." Although they made a huge mistake with their misleading Total Blueberry Pomegranate cereal, they do provide several healthy brands such as Cascadian Farm and Muir Glen. They also bought Larabar a year or two ago, and that's a decent food bar (although it's still not organic). We want to help educate General Mills to the fact that customers are smarter than they think. We are paying attention, and we will boycott General Mills when they decide to treat us like consumer morons. Join us in contacting General Mills and urging them to stop their deceptive marketing practices that deceive consumers about what's really inside the box. I am a General Mills customer who is appalled at the dishonest product naming and labeling used to promote Total Blueberry Pomegranate Cereal, which contains no blueberries nor pomegranates. I am joining an online protest organized by NaturalNews.com and the non-profit Consumer Wellness Center to urge you to recall this falsely-labeled product and either change the product name and labeling or reformulate it to contain actual blueberries and pomegranates. As a health-conscious consumer, I strongly object to your use of these superfoods in the name and labeling of your Total cereal when your own ingredients reveal the blueberries to be faked through the use of artificial food coloring chemicals, vegetable oils and processed sugars. Until such time that you announce your intention to remedy the misleading labeling and marketing of your Total cereal product, I will join NaturalNews.com in boycotting all General Mills products as a measure of protest against deceptive marketing practices. Keep in mind that if you give General Mills your *real* email address in their contact form, they will obviously have your email. (And I'm not sure how they will use it.) So you may wish to use a throwaway email address when using their feedback form. That's up to you. I personally don't want General Mills sending me promotional emails for Lucky Charms.